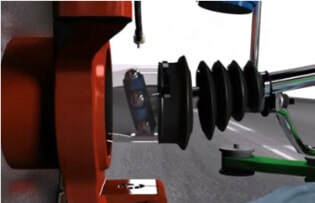 A constant velocity or CV axle joint allows the engine power to be transmitted from the transmission to the wheels at a variety of different angles. 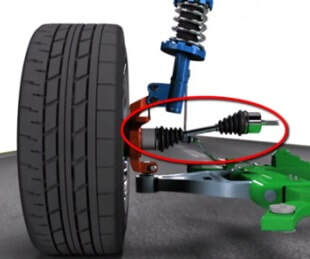 Almost all axles that send power to the front wheels use CV joints. The CV joint is lubricated with heavy grease, and is covered with a CV boot. When the boot is torn, the grease leaks out and the CV joint overheats. This normally makes a loud clicking noise when the vehicle turns at low speeds. When a CV boot has been torn, replacement of the complete CV axle is usually recommended. Constant-velocity joints are protected by a rubber boot. Cracks and splits in the boot will allow contaminants to enter and grease to leak out.